Last year about this time I saw the new designed Delta Midi Lathe. I new then that I would like to get one although I really didn't have a need for it, I just liked it. 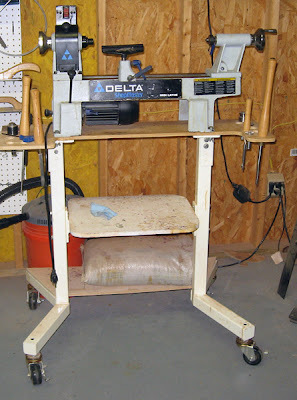 My older Delta Midi is working fine and there was no way that I could justfiy buying another Midi since I really only use it for small turning and doing wood turning demostrations which I haven't done since injurying my leg that left me with a handicapp. 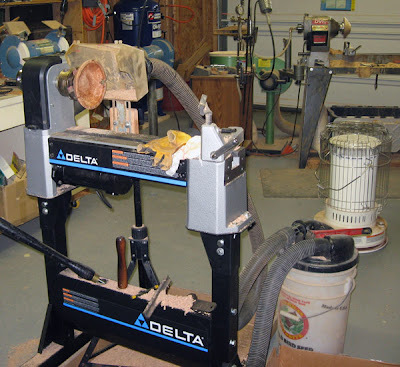 Last week I saw that Woodcraft had this lathe on sale. That was all I needed to know and so I bought it even though I didn't need it. I have the lathe all set up and did my first woodturning on it today, It not finish but I was very impress with how good the new lathe worked. Well the truth is I needed some inspiration to get back to woodturning more which I have neglected for the past year. I even considered just giving up woodturning and devote most of my spare time to my Bee Keeping and Photography. Finally I dicided I could still do all of them but I know I am going to have to manage my time better. In my next blog I expect to post some pictures of new woodturning and I like to know what you guys think of them when I do.